When you run tests in a Default test set manually, you follow the test steps and perform operations on the application under test. You pass or fail each step, depending on whether the actual application results match the expected output. You can run both manual and automated tests manually. You can execute tests more than once in the same set. Each execution is considered a new test run. You can also resume a manual test run that was paused during execution. If you decide to modify test steps during a test run, you can choose to save the modifications in the original test and in the test instance. Alternatively, you can save them for the current test run only. After test execution is complete, you can view a summary of results for all test runs, and view more detailed results for each test instance. 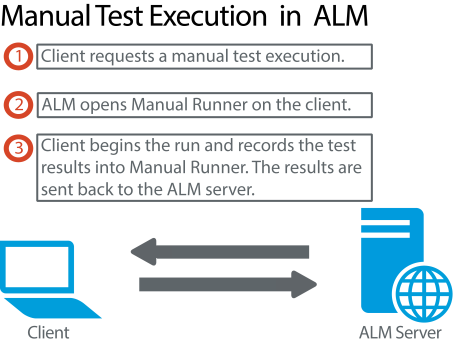 You run tests manually in ALM using Sprinter, Micro Focus's solution for manual testing. For details, see Sprinter Overview. If you are not working with Sprinter, you run tests manually using Manual Runner. For task details, see How to Run Tests Manually.